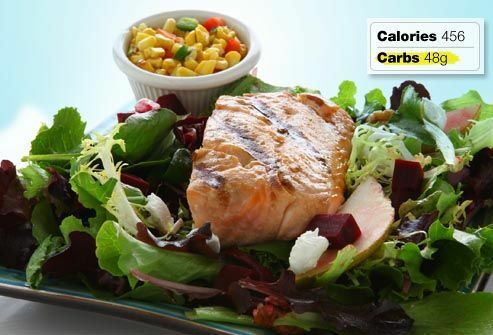 When you have type 2 diabetes, you need to eat a good mix of protein, carbohydrates, and healthy fats. So what's a well-balanced dinner? A power breakfast? The following meal examples can help you make better choices. Some people find it helps to count carbs. Keep in mind recommendations from your doctor or nutritionist, too. No food is off-limits with diabetes, but this brunch will blow your carb and calorie budget in a hurry. Experts suggest that meals for people with diabetes should have 45-75 grams of carbohydrates, depending on individual goals. Your body weight, activity, and medications all matter. 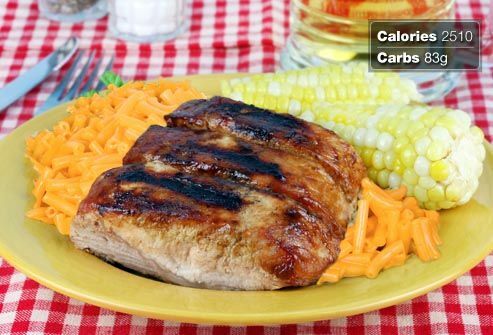 This meal packs enough carbs for four to five meals. 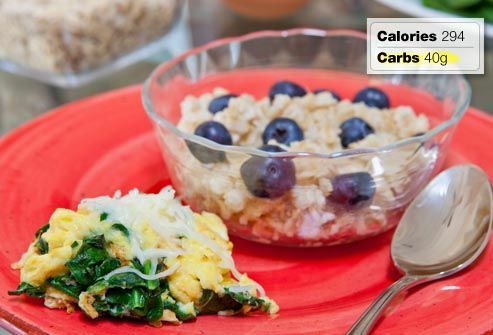 This quick meal delivers protein in a scrambled egg, and just 40 carbs, mostly from fiber-rich oatmeal and blueberries. Fiber slows digestion to help prevent blood sugar spikes. People with diabetes need to watch all types of carbs: cereal, bread, rice, pasta, starchy veggies, sweets, fruit, milk, and yogurt. Spread your total carbs across the day. The Count: 1,760 calories, 183 g carbs. 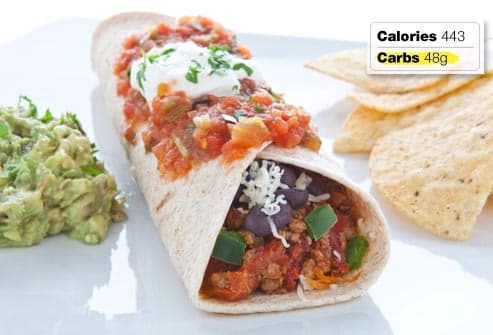 Before one bite of burrito, you can get 98 grams of carbs and 810 calories in a basket of chips and salsa. 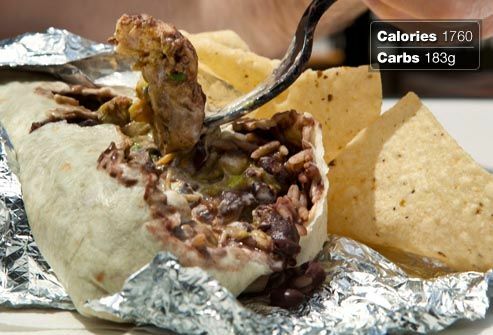 If you're trying to slim down and eat less sodium, like many people with diabetes, the burrito adds 950 calories. You also get way more than a whole day's worth of sodium. Lean beef and black beans make this Mexican dish a good option for a diabetic diet. The fiber in the beans can help lower blood cholesterol and control blood sugar. Go heavy on the veggies and light on cheese. Enjoy 10 small corn chips (1 ounce) with a little guacamole. This classic Southern meal loads too many splurge foods onto one plate. Fatty pork ribs are dripping in sugary barbecue sauce and flanked by macaroni and cheese and corn on the cob. Corn is a high-carb vegetable, with about 19 grams of carbs in one medium ear. It's just too much, all around. Pork tenderloin is one of the leanest and most versatile cuts of meat. Here it's prepared in a Dijon mustard glaze, and served with steamed broccoli and mock mashed potatoes. Pureed cauliflower stands in beautifully for carb-heavy white potatoes. Round out the meal with a whole wheat dinner roll. 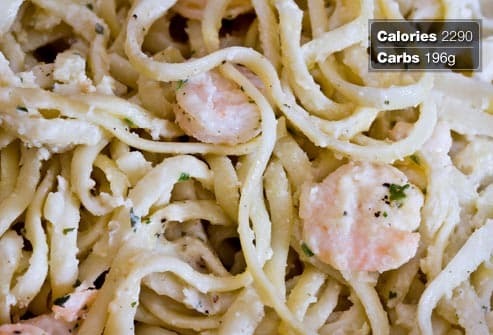 A typical shrimp pasta Alfredo in your local eatery can have huge portions and 73 grams of artery-clogging saturated fat. Diabetes makes heart disease more likely, so doctors advise limiting saturated fat to about 15 grams per day for a 2,000-calorie diet. Low-fat shrimp and juicy, ripe tomatoes make this pasta dish a winner for everyone. Feta cheese has a tangy flavor with one-third less fat than hard cheese. Try pasta that is made of 50% to 100% whole grain to add the benefits of fiber: better blood sugar control and more satisfaction. Lunch is just as important as other meals when you have diabetes, so don't grab just any sandwich or wrap. Ready-to-eat tuna salad can be swimming in mayonnaise. 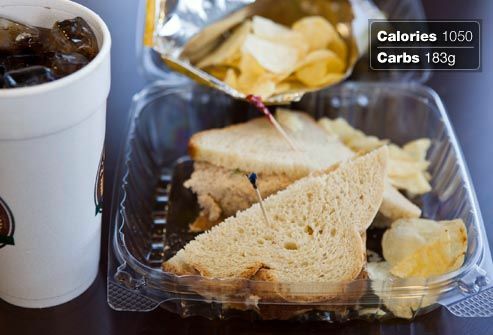 Chips and a large sweetened drink push the total carbs to 183 grams: far too much. 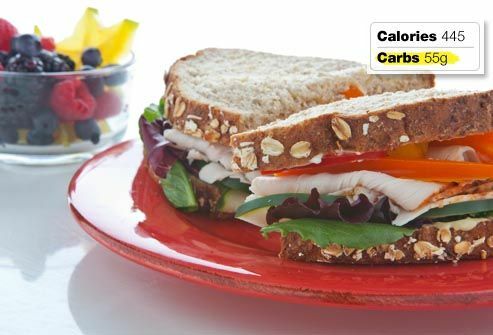 Order a turkey sandwich on fresh, whole-grain bread, piled high with veggies. Make it a combo with fruit salad and a glass of low-fat milk for a terrific, diabetes-friendly meal. Six grams of fiber helps to manage blood sugar. Milk, fruit, and veggies are all high in potassium to help lower blood pressure. 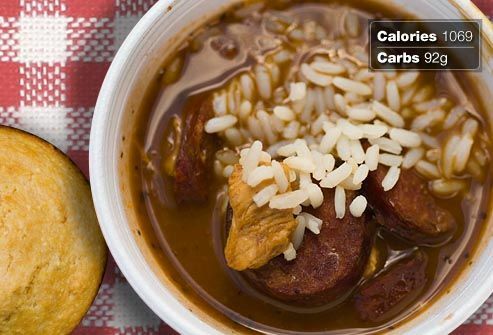 Rotisserie chicken provides a reasonable start for a Cajun gumbo lunch, but the sausage, oily soup base, and giant corn muffin make this meal a problem. Fat, saturated fat, and calories are sky-high. 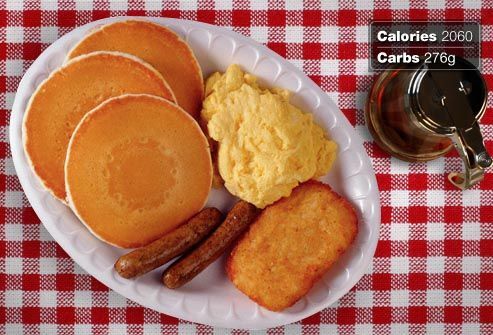 The large corn muffin has 71 grams of carbs. A mini-muffin offers the same taste for only about 9 grams of carbs. Gumbos you make at home are more likely to fit within your meal plan. 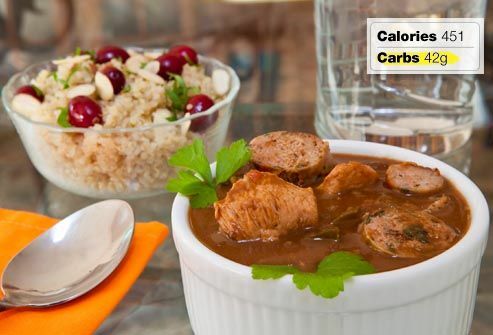 Use reduced-fat sausage, authentic Cajun flavors, brown rice, and lots of high-fiber vegetables. Add a whole-grain salad medley with nuts, dried fruit, and chopped veggies. 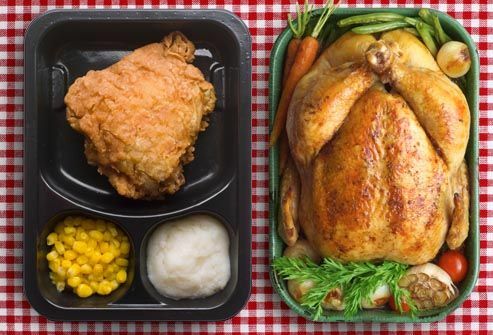 Skip the fried chicken, mashed potato, and biscuit combo at your local chicken joint. 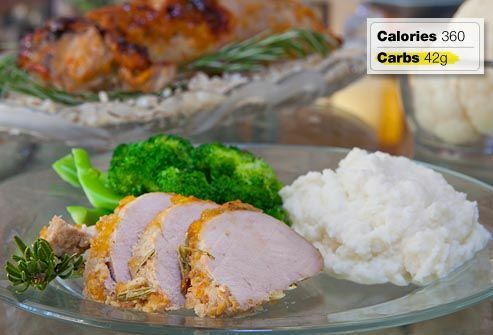 Even if you order the white meat chicken breast, this meal is heavy on carbs and fat. It also has more than twice as much sodium as you should get in a day if you have diabetes. Roast chicken is simple to make. Serve up 1/2 cup of breast meat, skin removed. 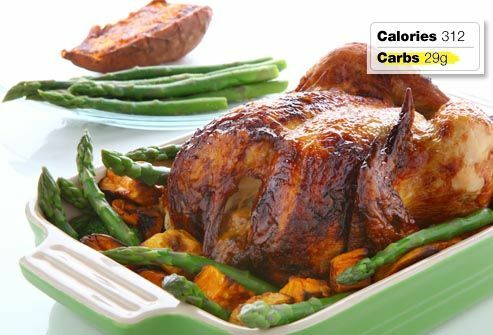 Add sweet potatoes and asparagus for a super-nutritious meal. The potatoes are high in fiber and vitamin A. They're so naturally sweet, all they need is a sprinkle of cinnamon, a spice that may help manage blood sugar. 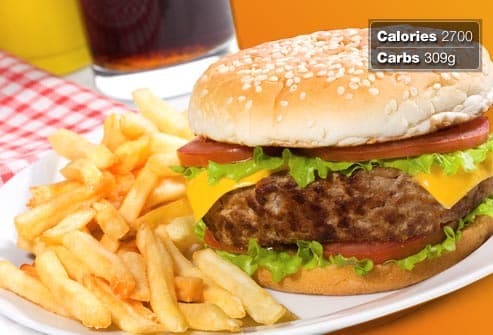 A bacon cheeseburger, large fries, and large soda have more than a day's worth of carbs, 2,700 calories, and 44 grams of saturated fat. "Upsizing" and low prices make it hard to eat small portions in burger joints. Make this Asian Tuna Burger at home. Tuna gives you heart-healthy omega-3 fatty acids. 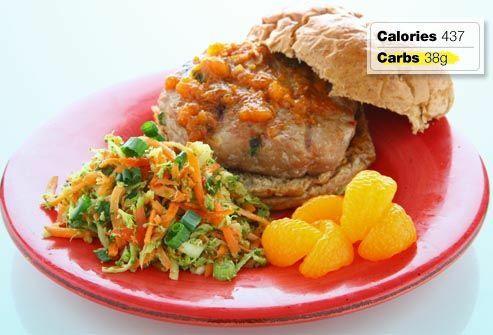 Add a whole-grain bun, 1/2 cup of broccoli-carrot slaw, and a few orange slices. 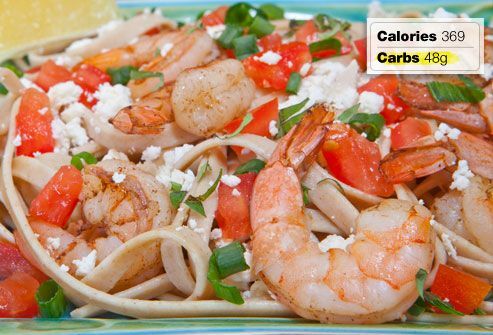 Skip the bun to shave 23 grams of carbs from your plate. Turkey and veggie burgers can also be good alternatives, if you check the calorie count. Fish is part of a heart-healthy diet, unless it happens to be fried. 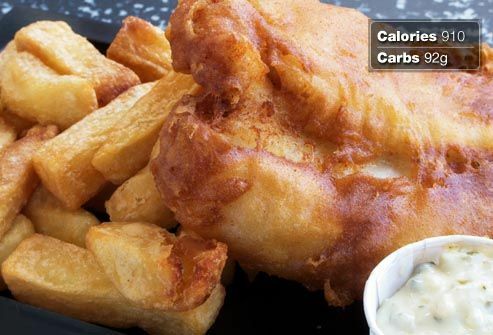 The breading, oil, and extra calories cancel out the health benefits of the fish itself. Beware of fried sides, too, as well as coleslaw slathered in sugary mayonnaise dressing. A super meal for people with diabetes, or anyone else, begins with grilled or baked fish. A grilled corn salsa and a beet, pear, and walnut salad round out the meal. The total carbs don't go overboard (48 grams), and there's a good balance of other key nutrients: protein, fiber, and fat. 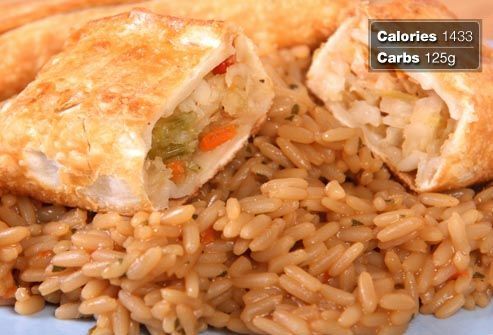 Deep-fried egg rolls, fried rice, and a main dish dripping in oily sauce make this meal an unhealthy choice. 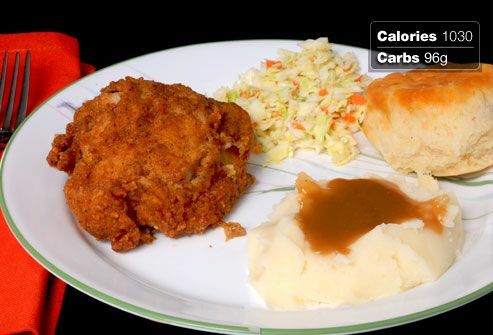 The total sodium in this type of meal is more than most people with diabetes should have over 3 days. Beware the MSG (monosodium glutamate), a seasoning that sends the sodium content soaring. 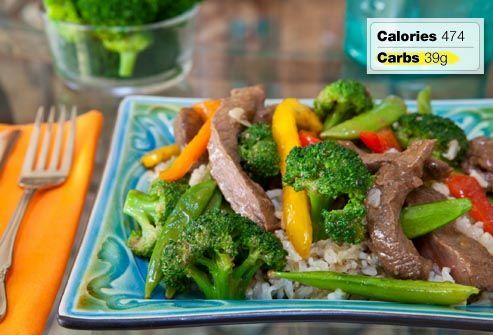 Make your own beef and broccoli stir-fry meal, so you can choose a lean cut of beef and low-sodium soy sauce. Skip the greasy noodles and fried rice -- both options are full of carbs, calories, and fat. Load up on stir-fried veggies instead. Choose steamed instead of fried pot stickers to shave fat calories. For even less sodium, skip the soy sauce. Akilen, R. Diabetic Medicine, October 2010. American Diabetes Association. Complete Guide to Diabetes, 2011. Hurley, J. Nutrition Action Healthletter, March 21, 2007. Liebman, B. Nutrition Action Healthletter, December 2011. Constance Brown-Riggs, MSEd, RD, CDE, spokeswoman, Academy of Nutrition and Dietetics; author, The African American Guide To Living Well With Diabetes, Career Press, 2010.